This is a map of Kent, Sussex, Surrey and Middlesex in the south east of England. It forms part of an atlas that belonged to William Cecil Lord Burghley, Elizabeth I's Secretary of State. Burghley used this atlas to illustrate domestic matters. The map is the work of Christopher Saxton. Saxton is first recorded in 1570 as an apprentice to John Rudd, Vicar of Dewsbury from 1554 to 1570. Rudd had a keen interest in cartography and had been engaged in the 1550’s in making a "platt" of England. When in 1561 Rudd was granted leave to travel further to map the country it is likely that Saxton accompanied him, acquiring his skills for surveying. After Saxton’s arrival in London he came under the patronage and supervision of Thomas Seckford and began to survey and map the counties of England and Wales. Seckford, Master of the Receipts at the Court of Elizabeth I, was ordered by the Queen Elizabeth's Privy Council to undertake the first concerted mapping of England and Wales. 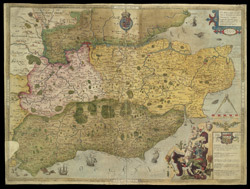 It is likely that this map was produced before Seckford became involved; the Seckford arms are miniaturised in comparison to their appearance in other maps of the series, suggesting they were added later. The map is also drawn at a reduced scale, incorporating several counties. This would have been perceived as a problem by Lord Burghley, a keen observer of cartographic developments, as such a small scale does not allow sufficient detail of the coastlines to be included. For matters of defence it was vital that the coast lines were well mapped, so that weak points could be defended and places likely to be used for enemy landings made hostile. It is possible that after seeing this map, Burghley put Seckford in charge of Saxton’s work, ensuring that the subsequent maps were drawn at a larger scale, limiting their coverage to the smallest viable unit, that of a single county. Lord Burghley annotated the proofs of the Saxton atlas in his possession, of which this one, adding ‘atherygton’ to the coast line of Arrundell Haven, confirming his preoccupation with the coast lines.